I got 4 hours of sleep before the alarm went off at 3:15am. Ouch. I rode the bus to the starting line with the Dansie’s, Nielson’s, Shelley, and Darrel. That bus ride seemed to take FOREVER! We arrived at the starting line amid the chaos of thousands of people, bright lights, and loud music. I was nervous and excited and cold. We took a few photos before heading to the bonfires. The guy on the loudspeaker would come on every once in a while saying it was 39 or 40 degrees. We were cold, but in terms of racing weather, you could not have picked a better day for the marathon. 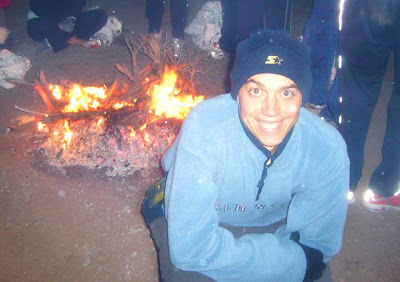 The starting line had long rows of bonfires that we huddled around to try and stay warm. A horn sounded and the marathon began. 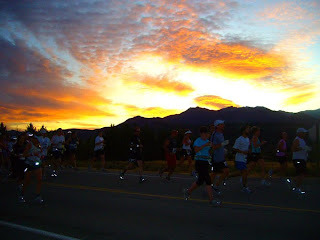 A mile or two into the race, the sun started to come up. I had to pull over to the side a few times to take some pictures. The sunrise was beautiful. It was a crazy feeling to be among a sea of thousands of runners. It was a little claustrophobic to not be able to speed up or move around. I was praying that I didn’t step on someone or have someone step on me. Early in the race I glanced over to the left and my jaw dropped. I’m being totally serious – running right to the left of me was Abraham Lincoln! 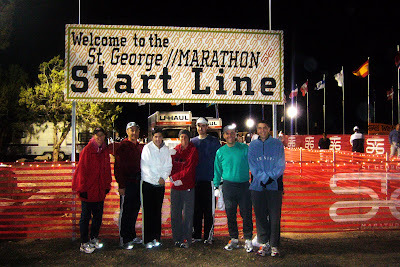 I ran the St. George Marathon with Lincoln. I felt too sheepish to pull out my camera and take a picture of him, but trust me, this guy looked exactly like Lincoln. If this happened at the end, I’d attribute it to a hallucination, but this happened at the beginning. When race pictures are posted, I’ll scour the photos to see if I can show him to you. 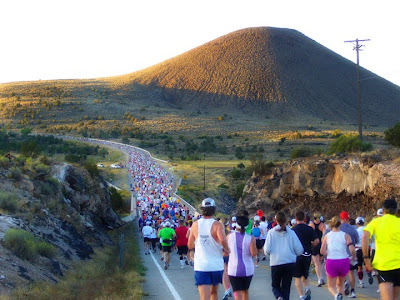 By mile 8 we were in the midst of the dreaded Veyo Hill. One of the best signs I saw was in the middle of the hill. It said “Don’t you wish you were a Transformer right now?” The wave of people heading for the hill made me need to stop again for a few more pictures. Before the hill started a guy named Andrew asked if we new each other. We talked for a while but concluded that even though I looked familiar to him, we didn’t know each other. It was nice to talk to him for the next five miles and have a bit of a distraction from the pain. It was his first marathon too and we both didn’t know what to expect. We were trusting the pace group leader to get us to the end. But somewhere in the craziness of a drink station we lost each other and I never saw him again. My plan was to stay with the 4 hour pace group. The pace group leader was experienced and I trusted that he knew what he was doing way more than me. I paid for this decision later though. When he came to a drink station he would grab a drink and then sprint ahead. I didn’t want to lose sight of him so I’d speed up for the next few minutes to catch up to him. I was right next to him until each drink station when he would dart ahead. At the mile 15 drink station I decided this wasn’t working for me, but I think by then it was too late. 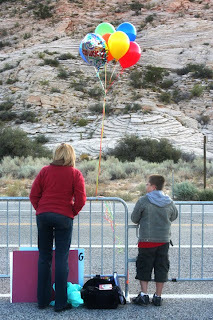 It was disheartening when I grabbed a drink, then looked ahead to see his balloons way down the road. By this time I wasn’t feeling so good. My legs were starting to cramp. But we were coming up to Snow Canyon (and another stop for a few quick pictures). 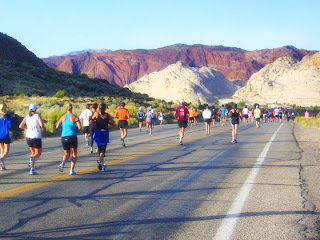 I was pushing myself to Snow Canyon at mile 16 because I knew I had visitors. 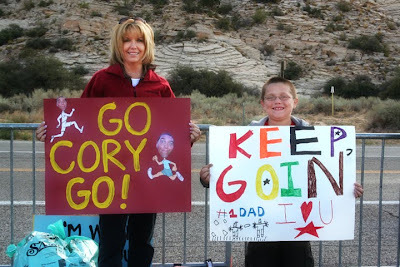 My awesome mom and sister came down from Salt Lake to cheer me on. They had Jackson with them too. I was so happy to finally see them, with balloons and signs in hand. I stopped for a minute to say hello and they gave me a bottle of water which I desperately needed. I felt dehydrated. Hollie encouraged me to be a winged liger. Then I set off again. Shortly after that I got a choked up, although I didn’t have the physical strength or fluid to cry. I thought about all the support my family has given me over the last year. I thought about how thankful I was that my mom and sister drove down to support me. All the cheering from the crowd touched me. I was happy. A few miles later I saw my grandparents who were waiting at Winchester Hills. This gave me another boost. They were so excited. My grandpa who has the funniest sense of humor yelled “You’re In First Place! You’re In First Place!” That made me smile and laugh. 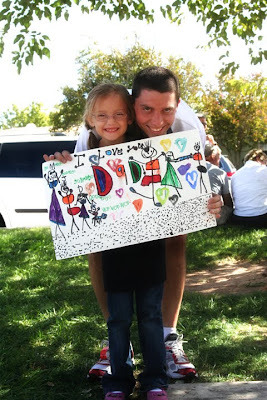 Around the same time, there was a little girl that was handing out Otter Pops to runners. I wanted to give her a big hug and tell her this was the most welcome gift I’d ever received. Instead I just took one and kept moving. At one point in the race a guy ran up by me and said “Hi Cory!” I think I gave him the “Hmmm, am I supposed to know you?” look. He said “You have some amazing music! I have your songs on my iPod.” I felt sorry for him if he was actually trying to run while listening to my music. That stuff can put you to sleep. But I appreciated the boost he gave. I wanted to give him a big hug and tell him this was the most welcome gift I’d ever received. Instead I just kept moving. The last ten miles of the race were truly excruciating. I’ve done three 20-milers and never felt close to this bad. My legs remained cramped continually. When I was 19 years old I had a charley horse that woke me up out of my sleep and hurt so bad that it made me throw up. This is what my legs felt like for the last ten miles. At the drink stations there were people rubbing Bengay or Icy Hot on runners. I took advantage of this at 4 stops. But when someone touched my calves, it felt like they were rubbing my legs with curling irons. My legs were so cramped up that they were as hard as baseballs. This was my view as a volunteer whipped me around and started working on my legs. I was so thankful for his curling irons. I mean....hands. I can’t describe how bad my legs hurt. I tried to stretch them out, but then another part of the leg would shoot with pain. Sometimes I had to walk because I knew I would fall if I tried to run. I thought it was possible that my legs would give out and I would be eating concrete for lunch. For a few miles I was woozy and worried I would pass out. Around mile 22 I became emotional again because of the pain I was in. The emotion wasn’t at all about the fact that this was the worst pain I’ve ever been in. The emotion was because of the fact that I was in such pain, but I was still moving forward. I was proud of myself. I knew that even though I had to slow down, there was nothing that would keep me from crossing the finish line. By mile 20 I knew I was not going to beat 4 hours. But I truly didn’t care. I knew that I had given absolutely everything I had. I had obviously made tactical mistakes the first half of the race, but it wasn’t worth dwelling on. I knew I had worked hard over the last year and worked hard at the marathon so the finish time became unimportant. The last three miles were indescribable. All the runners around me were suffering. I wanted to help them but had nothing to give. The crowds were cheering, but at some points my legs just refused to go fast. My friend Ben met me around the last mile of the marathon. He had finished in 3:01 (Crazy!!!) and was going back up the course to look for his brother. He walked/jogged with me for about a half mile as I got closer to the finish line. He reminded me of the ice cream waiting at the finish. Finally I saw the balloons and finish line ahead. My legs slowly plodded ahead and carried me across the line. I had never, ever been so exhausted. I was feeling worse than I thought I would. A volunteer put a medal around my neck, and another volunteer was handing out ice cream to the runners. I ate a huge ice cream sandwich. Then I ate another. I felt famished and dehydrated. My watch said that I burned 3005 calories. I felt honored to have that medal around me neck. Eventually I met up with my family. They showed me more signs they had made. Mel had another surprise for me. 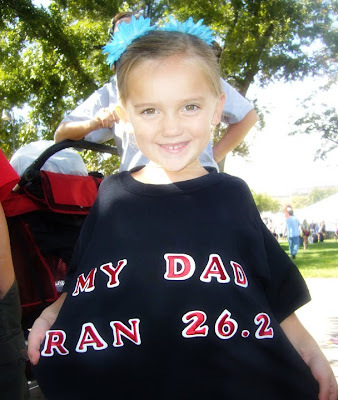 She made a shirt for each of the kids that said MY DAD RAN 26.2. Sometimes runners make specific goals for a marathon: an Ecstatic, a Happy, and a Satisfied goal. My Ecstatic goal was under 4 hours. My Happy goal was under 4 and a half hours. 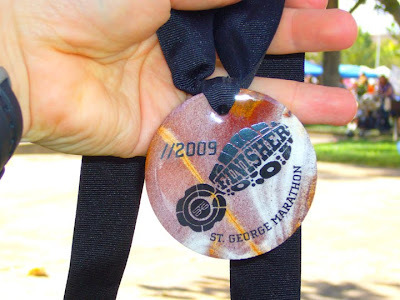 My satisfied goal was to finish a marathon. I was thrilled to have even completed a marathon. After all, the first guy who ever ran a marathon….died. 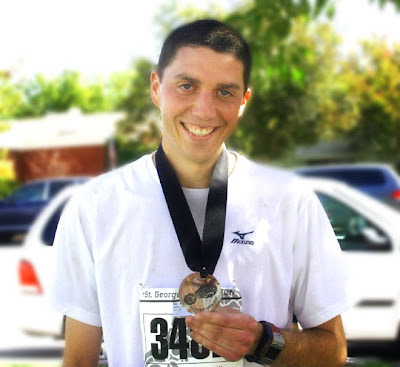 The awesome thing about my first marathon is that I set a Personal Record. I also have some leeway so that I can cream that record the next time I run a marathon. 26.2 miles is an absolutely obscene distance to run. It was excruciating and painful. It was challenging mentally and physically. It was rewarding and exhilarating. It was a hard-earned triumph. that otter pop was so awesome. i chose blue. great job and fun pics. will you email me the one of all of us at the start. i guess i can just get it off your blog. great narrative as well. Congratulations! I have ran 4 myself and I know the hard work that goes into training. The pain of losing numerous toe nails, the agony of coming out of hollow twist and the exhilaration of crossing the finish line. Way to go!!!! It's cool that you have so many great picts! I'm jealous! Congratulations Cory. The best part of that blog was your last statement. As much as it hurt, you want to do it again . . . and you will. Way to go! And thanks for letting us stop by the other night to meet your team. Running for a cause, I'm sure, made your accomplishment all the better. Thanks for posting over the last few months. Your posts really helped me keep going when the marathon training seemed to be too much. I still feel bad about missing you at the start of the race. I started about 2 feet in front of the four-hour pace guy. (that was a close as I could get.) Let me know if you need someone to run with this winter. Congrats on the finish! CONGRATULATIONS on an outstanding finish, Cor!! I am so incredibly proud of you and not only all you set out to do, but all you manage to accomplish. You truly are my hero and inspiration! You can ask Mom - being there was one of the most powerful and emotional experiences of my life. I think I bawled through all 26.2 miles of your run!! Barring any pregnancies, I CANNOT WAIT to be doing this with you next year (as long as you promise to draw a winged liger poster for my inspiration)! Great run Cory! I have really enjoyed your blog over the last few months. You have a great ability to connect your running / training to more important big picture stuff. Thanks. Congrats on accomplishing your goal. Awesome! Congrats dude - I ran a half-marathon last fall and you have given me one more reason to never ever run a full. You're a stronger man than I am. Rock on. Way to go Cory! We're really proud of you! See what I mean about that feeling? 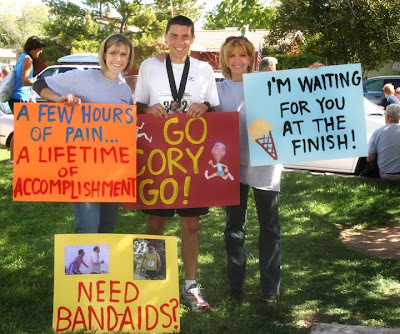 Let that feeling be your motivation in completing your next one, plus a delicious ice cream sandwhich, or four. Well done, plus 4:25 is an awesome place to work from-never forget that no two marathons are the same-if they are-you just aren't having fun. Run on Cory, Run on. Way to finish the race. I LOVED SGM. So awesome! I hope I can go back again one day. It was wonderful reading about your quest and journey. Congrats on accomplishing your goal. 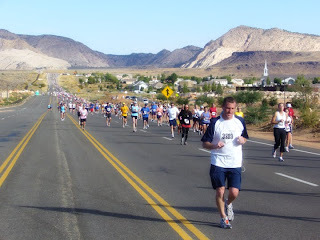 I'm running my first marathon - St. George - next month. Even though these posts are a few years old, they're giving me confidence and encouragement. Thanks!